Connie's World Adventure! : Kuala Lumpur, Malaysia: Birds and Fish and Towers, Oh My! 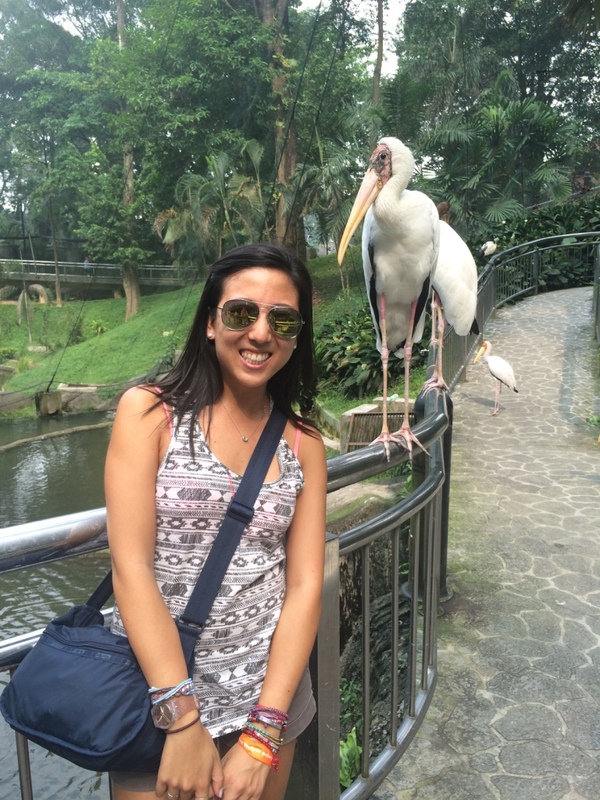 Kuala Lumpur, Malaysia: Birds and Fish and Towers, Oh My! 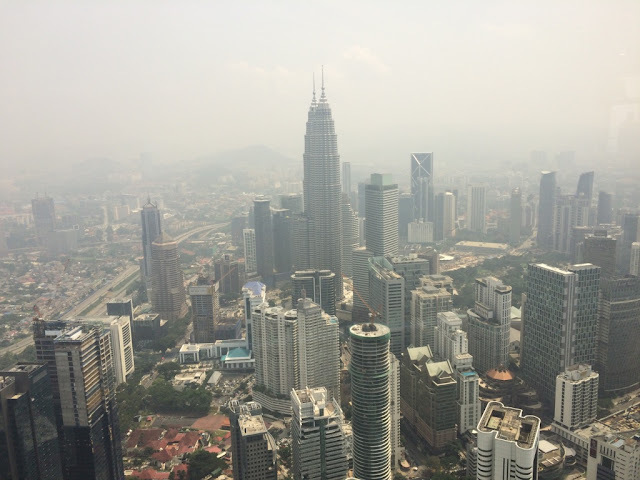 Before arriving in Kuala Lumpur (for short called KL), many people mentioned that it was one of those cities that didn't have that many things to do, and there weren't that many things to see there. That sounds like a challenge. Kuala Lumpur is the capital city of Malaysia, population 1.4 million. 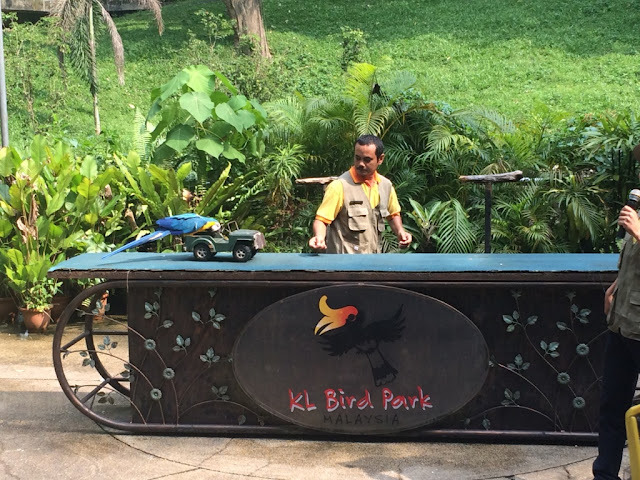 Malaysia is one of Southeast Asia's richest countries - therefore the city of KL is super nice and business-like and fancy (and by fancy, I mean there are no chickens running through the streets, which is my threshold for fancy in SE Asian cities). Malaysia has three distinct main ethnic groups - the Malay (who are Muslim) at about 60%, the Chinese at about 25%, and the rest Indian. Because the majority of Malaysia is Muslim, you see this influence everywhere - there aren't a ton of bars, and where there are bars, the alcohol prices are significantly higher vs. the rest of SE Asia. Because of this reason as well, there also weren't a ton of hard-partying young backpacker types that you typically encounter in other SE Asian countries (a thumbs up from me, the old crochet-y backpacker). Oh, and everyone speaks English, which makes traveling around this country just that much easier. Went to KL Menara in the morning, a telecommunications tower where you can ascend to the top and have an incredible view of all of KL. This experience was hilarious because the ground floor of the building has the kitchiest and most ridiculous combination of tourist-trap activities ever. They basically try to sell you everything. There's a petting zoo, a 3-D theater, shopping, an amphitheater, an aquarium, food court, etc. etc. Tempting, but I headed straight to the top. My favorite part was they had these free binoculars every so often - the lens was so powerful you could see into people's apartments and office buildings and lives - all things I find fascinating. Is this coming across creepy. After the tower, I met up with a hostel roomie I'd met the night before, Madison. She's from the U.S. but working on contract at an NGO in Cambodia, and was in KL on vacation for the week. 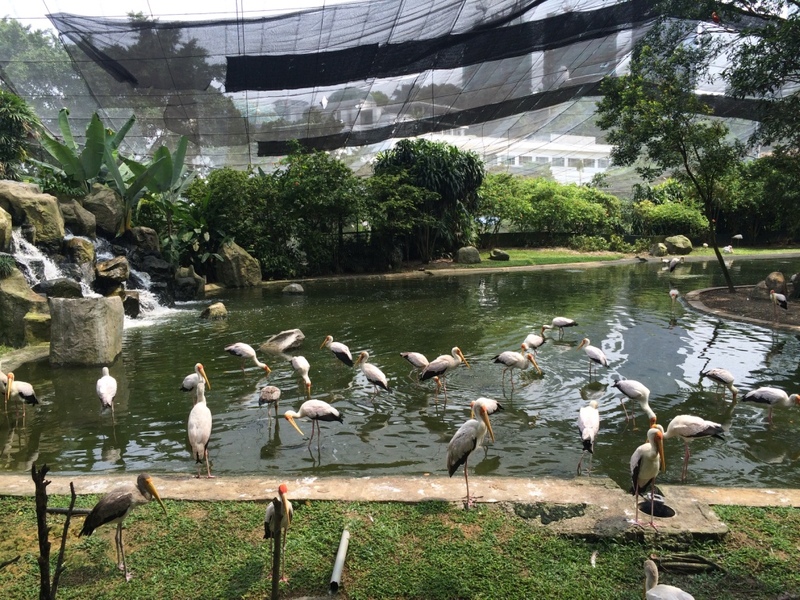 We went to the KL Bird Park, which is touted as the "largest free-flight walk-in aviary" (qualifiers much?). It's basically a huge swath of land that they've put a net over the top and you can walk amongst all the birds inside - which is so cool to me. Like, the birds are just chilling and flying around everywhere when you walk inside (which is technically outdoors; just under a huge net). And on the walk to the bird park, monkeys on the road! And the left one has a baby! 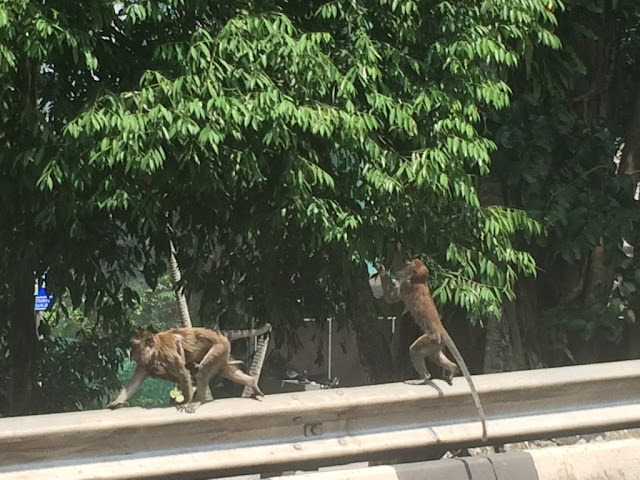 I'm sure my delight with the rando roadside monkeys is fairly equivalent to tourists who come to the US and are delighted by squirrels and take tons of photos of them. In my defense, I think squirrels are cute too. 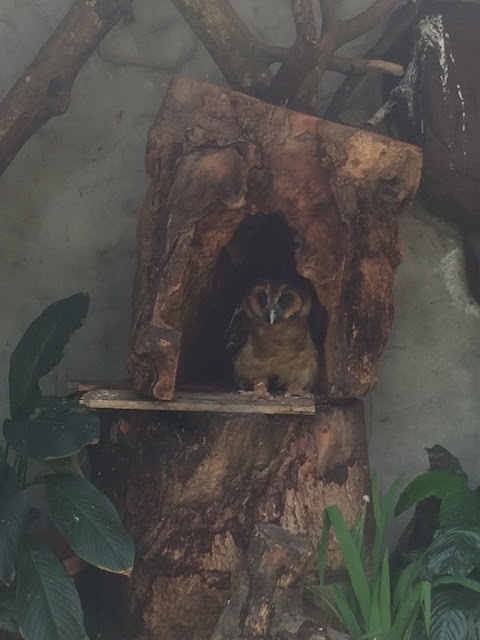 An adorable owl. 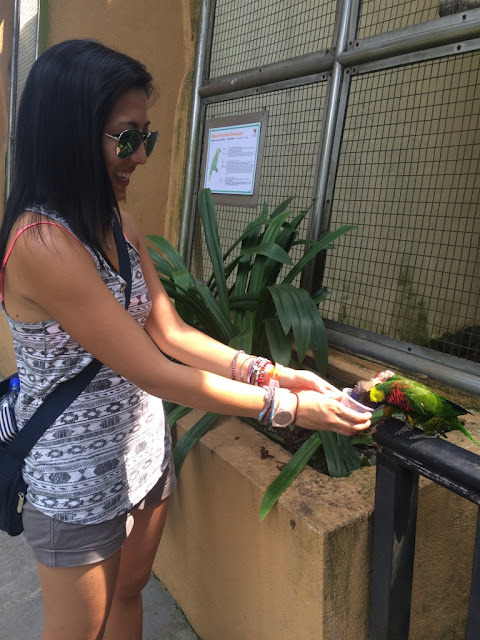 I think I have a secret love of birds. A giant heron thing. Obviously, along with my new love of birds comes a wealth of bird knowledge. A lake filled with giant heron things. These things would sense feeding time and basically stampede over to food. AND WE GOT TO FEED THE PARROTS. In case you were wondering, they drink cups of milk. The bird park was cool. 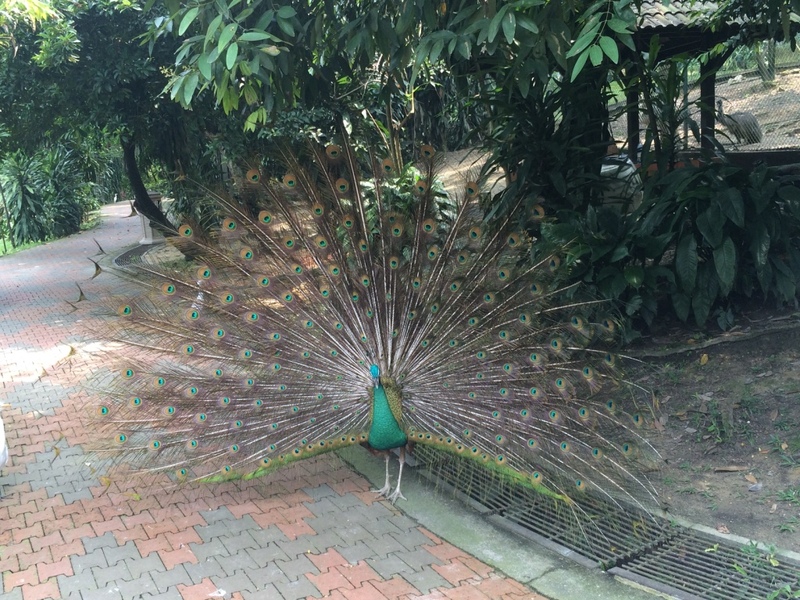 I was a huge fan of the bird park. At night, Madison and I headed down to Jln Alor, a street known for having tons and tons of delicious street food (something Malaysia is known for). 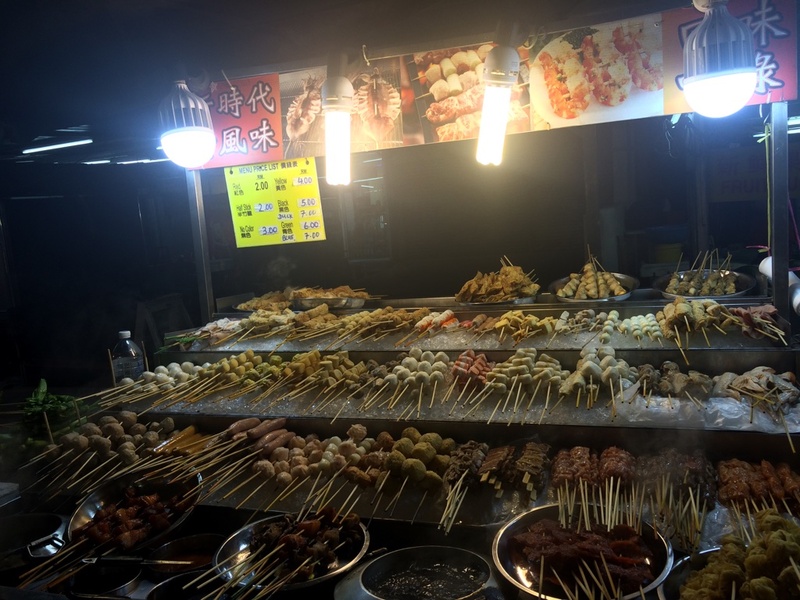 A food stand filled with hundreds of satay sticks. So much delicious satay. 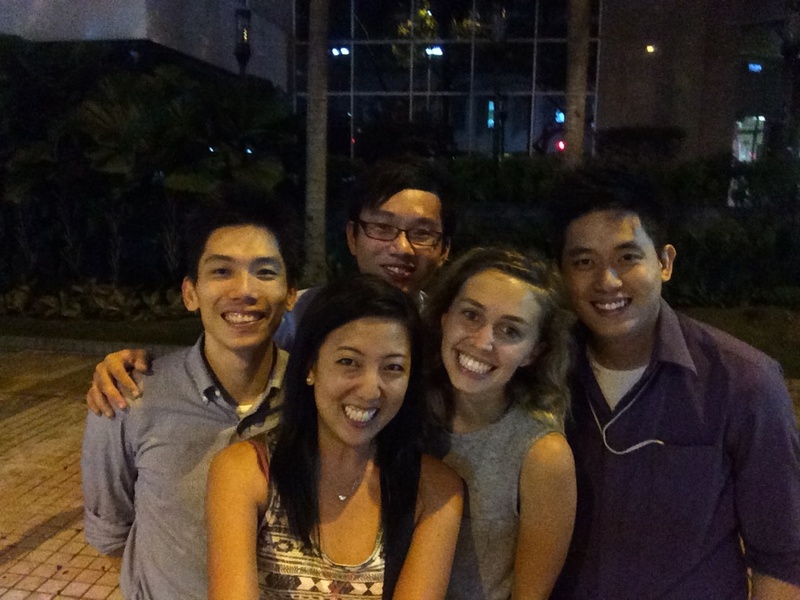 The best part of the night was post-dinner, when we were grabbing a glass of wine and three local Malaysian guys came over to chat with us. 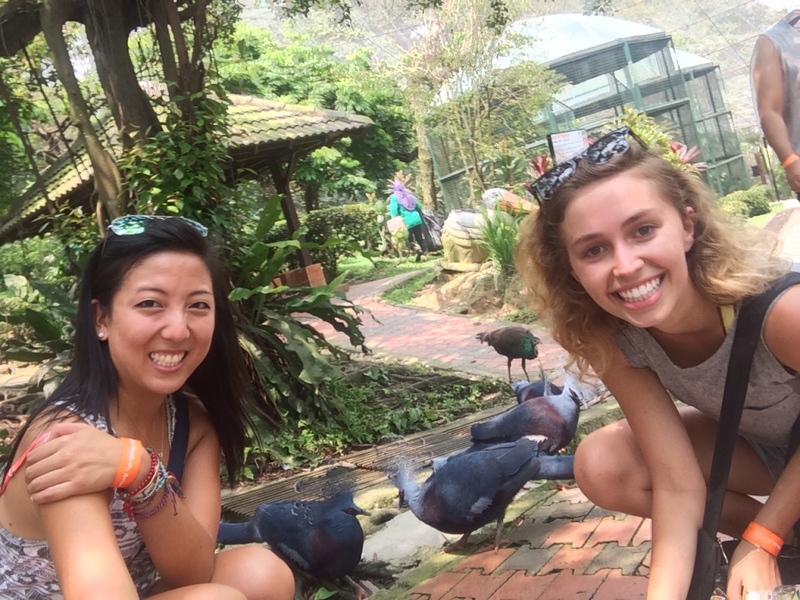 They were fascinating - we learned so, so much about life in Malaysia, and the different ethnic groups, and day-to-day living. We basically grilled these poor guys with a million questions about life in KL (many of these will be showing up in the Fun Facts section). Loved it. 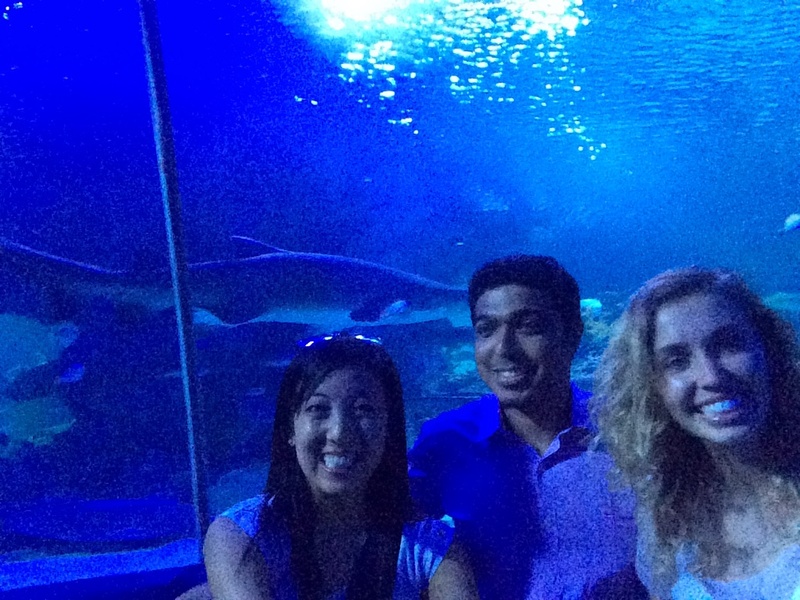 The next day, Madison and I were joined by a third hostel roommate, Aaron from India. 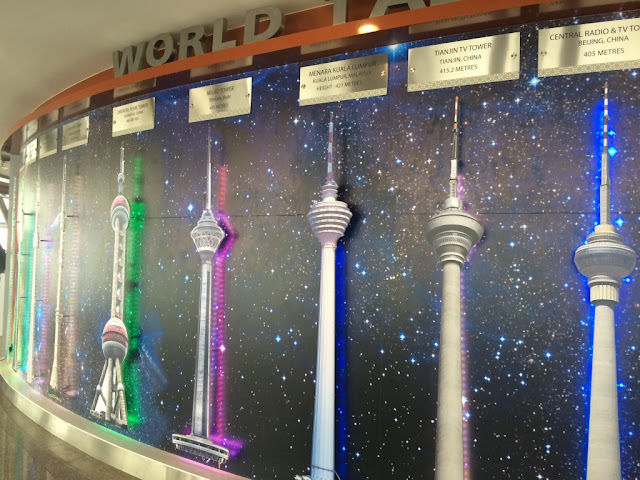 We started with a stop to the famous Petronas Twin Towers - these huge, 88-story towers that are some of the tallest in the world and filled with fancy shopping, stores, and offices. 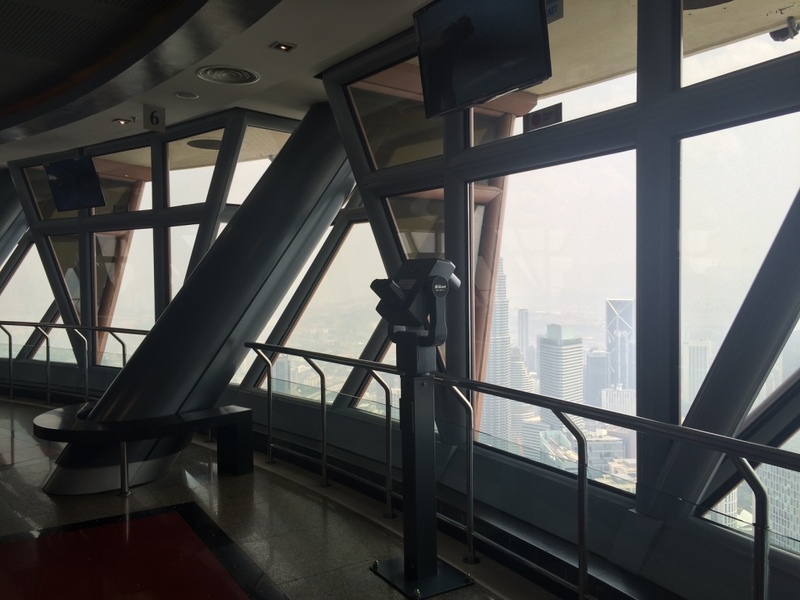 Petronas Towers!!!!! The five pillars are based on the five pillars of Islam, and the entire thing is 452 meters tall. 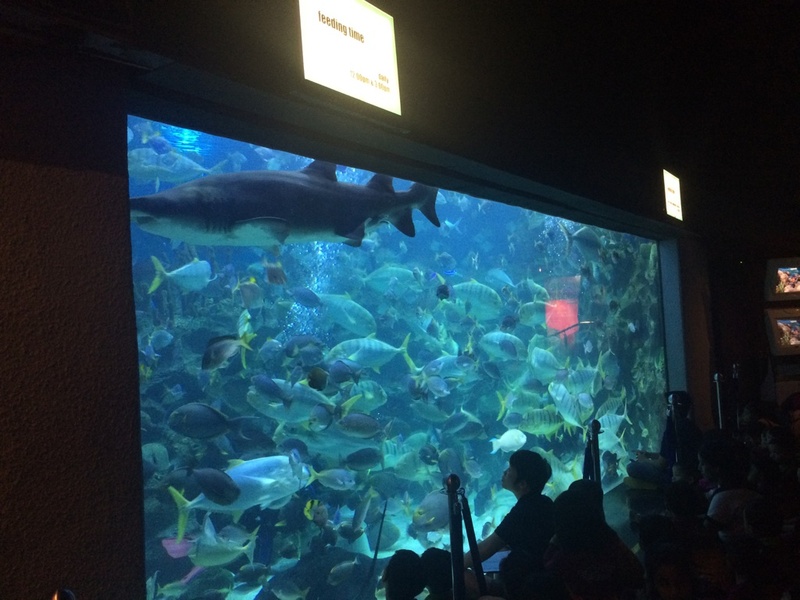 Then we continued our tour of KL's animals with a trip to the aquarium, Aquaria KLCC. 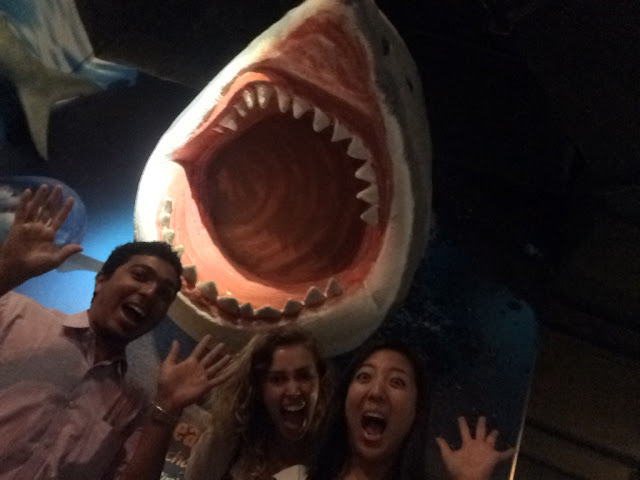 Highlights include: a piranha feeding where you basically saw a ton of piranhas annihilate the shiz out of some fish, the cutest fattest otters, and stingrays that smiled. I'm no aquatic life specialist, but does it seem like this tank has entirely too many fish inside it? 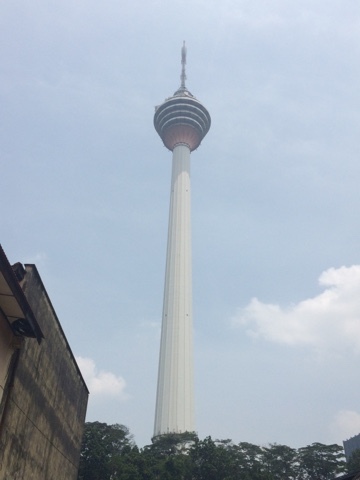 And with that, my KL adventure came to a close. In true form, I loved it and am so glad I came here! Who can hate otters and heron-like creatures?? Malaysia is like a bowl of mixed nuts vs. a melting pot; meaning the ethnic groups are pretty separated. The guys we encountered were from the Chinese-Malaysian community - the most interesting thing is that they're 4th of 5th generation Malaysian, but they still speak Cantonese to each other and when they encounter other people in their ethnic group. They only speak Malaysia's national language, Malay, when they speak to Malay people. And when they speak to Indian people in Malaysia, they use English. And at work, they use English mainly because there are multiple ethnic groups in one place. When we asked how they knew what language to speak to whom and how they knew what ethnic group someone was a part of, they said that they can just tell. Everyone in Malaysia can just tell (I mean, they basically just racially profile). I'm still slightly awed and confused by this because I'm sure there's intermarriage between the groups and people who look racially ambiguous, but to the guys we talked to, it's apparently usually pretty clear. On that same note, the predominant ethnic group, Malay, are Muslim - therefore they follow Islamic law where it is forbidden to drink alcohol, etc. The Malaysian police enforce Islamic law - in which they can arrest a Muslim for drinking in public because it violates Islamic law. When we asked how the police knew who was Muslim, it was again the racial profiling thing. The police can just tell who is Malay, so if they see a Malay drinking alcohol, they can arrest them. Whereas if a Chinese or Indian person is drinking alcohol, they don't care because they're not Muslim, therefore they're not doing anything illegal. It's. Crazy. Madison and I were trying to explain to the guys that this kind of racial profiling would not fly so well in America, and the guys seemed to be equally fascinated. Students in Malaysia are required to learn a foreign language. 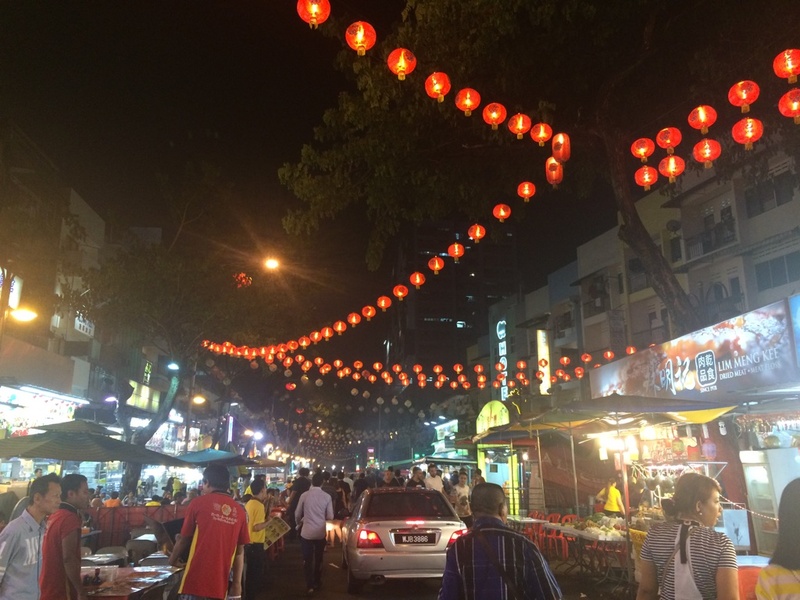 Therefore, in addition to Malay and English (and Chinese or Hindi, if you're part of those ethnic groups), people can usually speak an additional 3rd of 4th language. Amazing. Did u go try the restaurant I told you about?? Madam kwans? !